The Orlando Sentinel’s Mike Thomas had an excellent piece yesterday about the proposals that FL Legislators are making to bring a multitude of Las Vegas Casinos to Florida. He makes a strong and compelling case why this is bad public policy for the people of Florida. Thomas goes on to describe the decay and misery that gambling has brought to Las Vegas and the fiscal mess that Nevada is facing because they have relied so heavily on predatory gambling revenue. 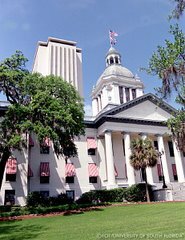 We still have a chance to let our Florida elected officials know that we do not want the state delving more into the predatory gambling industry. Research is clear: casinos lead to increased addiction, increased bankruptcy and increased crime. And they will decimate the surrounding small businesses which are already struggling to survive. Read the full column by Mike Thomas on OrlandoSentinel.com HERE. Last week the Florida Family Policy Council’s weekly E-Newsletter contained a story about yet a third South Florida activist judge who illegally approved a homosexual adoption in direct defiance of Florida’s law which prohibits the arrangements. The photo in the news piece we ran (red and blue shirts on left) was obtained from an online article about a different South Florida Judge who approved a different improper homosexual adoption. After receiving Stemberger’s explanation and correction, Maxwell himself never apologized for his irresponsible and judgmental rant against the FFPC but did blog on Stemberger's correction (see http://blogs.orlandosentinel.com/news_local_namesblog/2010/02/stemberger-wrong-pics-of-gay-couple-was-mistake.html) Unfortunately, he also never bothered to quote at all from the explanation given and again tried to put the FFPC in a bad light even after knowing the facts of both of our mistakes.